The European Commission (EC) has announced the award of three of the six contracts for the procurement of Galileo’s initial operational capability (IOC), including a €566-million (US$811.2-million) award to OHB System AG for a first order of 14 satellites. The European Commission (EC) has announced the award of three of the six contracts for the procurement of Galileo’s initial operational capability (IOC), including a €566-million (US$811.2-million) award to OHB System AG for a first order of 14 satellites.A contract for the system support services went to ThalesAleniaSpace of Italy and another, for launch services, to Arianespace of France. The January 7 announcement marks a major step forward for a GNSS program that had to find its way out of a yearslong political morass caused by an ultimately fruitless effort to form a public-private partnership (PPP) to fund and develop Galileo. In 2007, the EC proposed to build the system as a wholly public endeavor. In spring of 2008, the European Transport Council and the European Parliament approved new institutional arrangements for the program and a €3.4-billion ($4.87-billion) budget to build a fully operational capability (FOC) for the system by 2013. Last fall, however, program managers acknowledged that the cost of Galileo would exceed the €3.4-billion budget and take longer to implement. Program managers have downsized their expectations and now anticipate that Galileo will field an initial constellation of only 16 satellites (out of a planned 30) by the end of 2013: 4 in-orbit validation (IOV) satellites being built by EADS-Astrium and 12 FOC satellites. Platform-level integration tests on the engineering model of the Galileo IOV satellites were completed last year at the Thales Alenia Space facility in Rome. Integration testing is carried out to verify the correctness of the interfaces between the unit or subsystem under test and the larger system into which it has been integrated. The scope of functional testing is to demonstrate that the integrated units or subsystems are compliant with their design specification. The engineering model is used to mitigate the design risks associated with the proto-flight model and the three flight model satellites, by performing an early verification of the electrical functionality and interfaces of the spacecraft and the performance of the payload before the test campaign for the proto-flight model starts. The contract awarded to ThalesAleniaSpace for the system support services covers the industrial services needed to support the European Space Agency (ESA) for the integration and the validation of the Galileo system. It has a value of €85 (US$121.8) million. The contract with Arianespace covers the launch of five Soyuz launchers, each carrying two satellites. The first launch is scheduled for October 2012. The value of the contract amounts to €397 million (US$569 million). The contracts are expected to be signed in the next few weeks between the chosen companies and ESA, on behalf of the European Commission. The remaining three procurement contracts, for the ground mission infrastructure, the ground control infrastructure, and the operations should be awarded by mid-2010, according to the EC. Last November, ESA inaugurated the site of a ground station for Galileo inside the Guiana Space Centre (CSG), near Kourou in French Guiana. The site, which was made available by France’s Centre national d’études spatiales (CNES), will play an essential role in the setting up of the Galileo system. The Kourou facility will house the most comprehensive of the Galileo ground segment stations and consist of a telemetry, tracking and command (TT&C) station to monitor and control the Galileo constellation satellites, a sensor station (GSS) for acquisition of the satellite navigation signals, and two uplink stations (ULS) for transmission of navigation and integrity messages to the satellites. 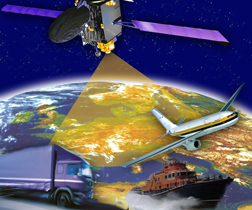 According to program managers, the FOC contracts will enable the initial deployment and service provision of Europe’s satellite navigation system as of early 2014. During the PPP era, the EC had hoped to have an FOC system in place by 2008. The signing of a framework contract in December with both OHB System AG and EADS-Astrium GmBH, both of Germany, paved the way for the eventual provision of a maximum of 32 satellites. OHB System is partnered with Surrey Satellite Technology Ltd. (SSTL), which built the Galileo experimental satellite GIOVE-A that just passed its fourth year in orbit on December 28 — well past its operational design life of one year. 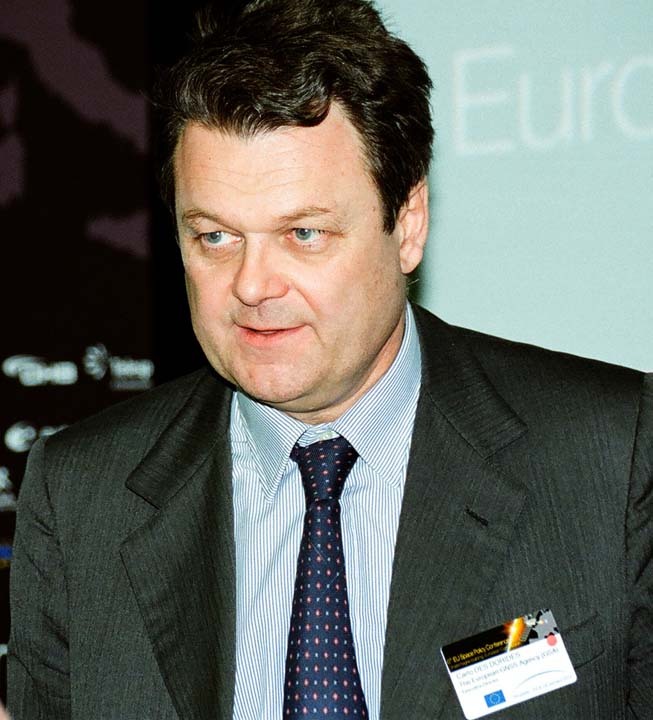 The two companies agreed to work together as a “core team” on Galileo at the end of 2007, with OHB taking the role of prime contractor and builder of the spacecraft “bus” and SSTL taking full responsibility for the navigation payloads onboard the satellite that will form the heart of the Galileo navigation system. EADS-Astrium later bought SSTL. Under the Galileo IOC contract, the first satellite will be delivered in July 2012, and then one satellite is expected to be completed every 1.5 months after that, with the last of the 14 spacecraft scheduled for delivery in March 2014. As a result of this decision, OHB-System will be assuming the role of prime contractor for the fabrication of the 14 satellites, including full responsibility for developing the satellite platform and overall integration of the satellites. SSTL will build and integrate the navigation payloads and support OHB with the final integration, using its successful experience from GIOVE-A, the first Galileo satellite, launched in 2005. The 14 satellites will be assembled in Bremen. “The award of this contract to our team reflects the European faith in fair competition and shows that the EC and ESA consider us to be a highly trustworthy satellite supplier with leading-edge technology,” said Berry Smutny, CEO of OHB-System AG. The remaining satellites will be procured in subsequent work orders, each time from either OHB or EADS-Astrium GmBH, depending on which company provides the most advantageous offer. The EC intends to follow a strategy of double sourcing to lower risks, particularly in terms of the timing of delivery, and to increase flexibility. The contract awarded to Arianespace calls for launch of five Soyuz rockets from Kourou, French Guiana, each taking two FOC satellites on board. The first launch is scheduled to take place in October 2012 and will be followed by four to five launches per year. The contract also contains options for either two additional Soyuz launches (carrying two satellites) or one Ariane 5 (carrying four satellites). EC representatives say that they are now able to better schedule the timings for the provision of the different Galileo services: the Open Service, the Public Regulated Service and the Search And Rescue Service will be provided as of early 2014. The Safety-of-Life Service and the Commercial Service will be tested as of 2014 and will be provided as Galileo reaches full operational capability with a constellation of 30 satellites. Through a framework contract lasting from 2010 till 2016, a specific contract for a first work order was awarded to ThalesAleniaSpace. The specific contract for the first order lasts from 2010 till 2014, and includes the following services: system engineering, system performance engineering, signal-in-space engineering, security engineering, ground segment engineering, system assembly, integration and verification, product assurance. The new payload will operate in L-band and be located onboard SES ASTRA’s new ASTRA 5B satellite that was recently ordered from EADS Astrium. The satellite is scheduled for launch in the second quarter of 2013 and will be positioned at SES ASTRA’s 31.5 degrees East orbital position. In addition to the payload, SES ASTRA will also provide the related ground infrastructure needed to operate the awarded payload. The award follows a first agreement reached in March 2009 for EGNOS-hosted payload services onboard SES ASTRA’s Sirius 5 satellite, currently under construction by Space Systems/Loral and scheduled for launch in the second half of 2011. Sirius 5 will be positioned at the 5 degrees East orbital position. In addition to EGNOS, SES ASTRA is already providing infrastructure services to Galileo.